To Future Women is a 20 year time capsule of letters written to the next generation of women to memorialize the 2017 Women's March and ongoing #MeToo movement. 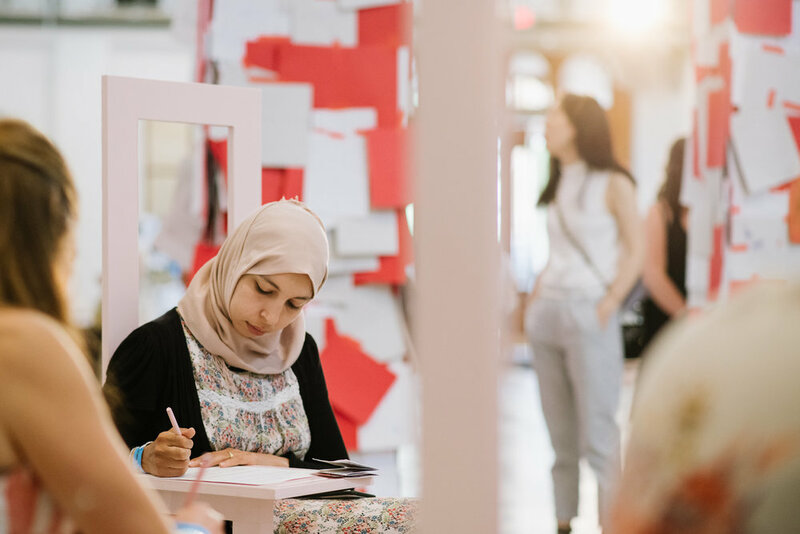 It is a networked interactive artwork that invites participants - women, men and all gendered identities - around the world to write a letter to women in twenty years time. Part art and part history, this collection of letters will be archived for twenty years in Washington, DC by national museums and re-exhibited in 2037 on the 20th anniversary of the Women’s March. To Future Women uses the platform of art to historicize one of the largest single protests in global history. To date, To Future Women has received over 3000 letters in 10 different languages, including from Hillary Clinton and Dr Jill Biden, and been covered by press all over the world. 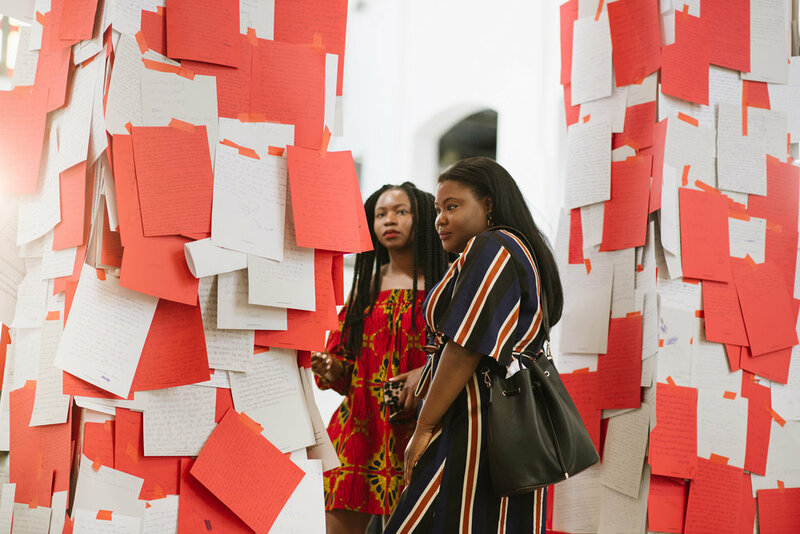 The project launched at The Phillips Collection on 21st January, 2018, the one year anniversary of the Women's March, and traveled to different cultural institutions in Washington, DC over the following six months, including the Smithsonian's Hirshhorn Museum & Sculpture Garden, the Anacostia Art Center, the Smithsonian Arts & Industries Building and IA&A at Hillyer. Lullaby is born out of the artist’s yearning for an architecture that is intimate and maternal. The video installation represents Saxelby’s ongoing investigation of the relationship between architecture, ritual and gender. Working with the underlying ethos that symbolic actions and spaces define and shape us, the artist asks the question: Can the monumental forms that surround me, reflect me? This work investigates the monument as a site for emotional reactivation and questions the symbolic spaces in which cultural identities and values are performed. Saxelby worked with performance artists Vanessa Soudan (US) and Bailey Nolan (US) to develop a series of invented ritualized gestures drawing from personal experience to be performed within the monumental structures of the National Mall in Washington, DC. These performances occupy, misuse and supplement the Mall’s classical Greco-Roman architectural forms. They create a symbolic instability that disrupts the masculine iconography and hierarchies the monuments’ contain for a new symbolic order of the artist’s making. Entitled Lullaby, this work reflects Saxelby’s interest in women-driven methods of performing and passing down cultural knowledge, identities and value systems. In the performative installation The Architecture of a Witch’s Hut, Saxelby imagines the agency of the witch in building her own home and reconsiders the archetypal figure as a powerful symbol of female independence. 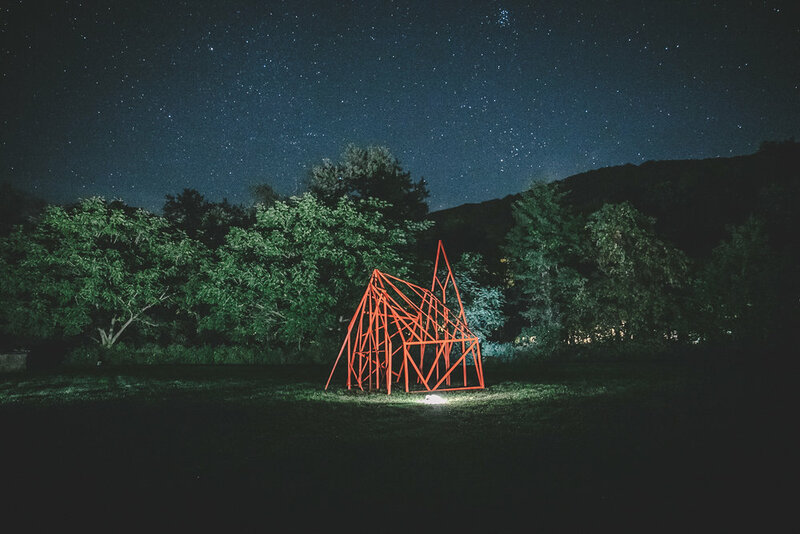 The structure was built by the artist alone during a residency in upstate New York, and references the surrounding New England architecture and the real history of the burning of accused women in the area 300 years prior. 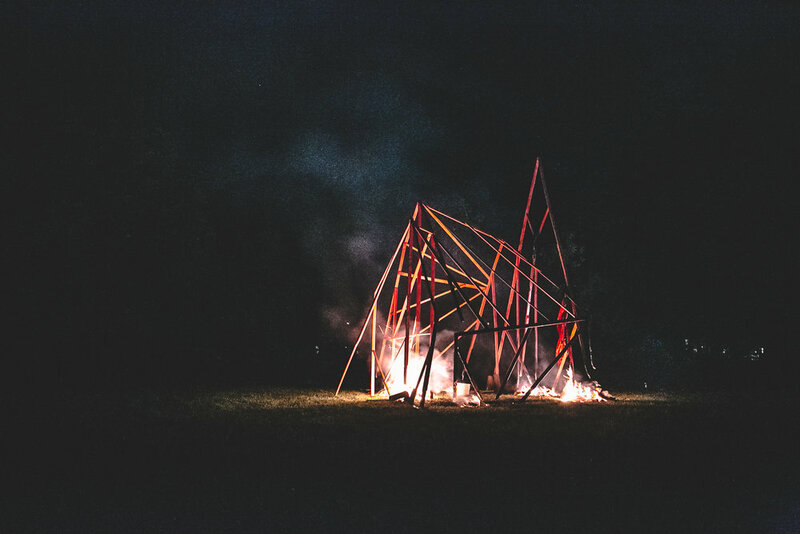 Probing historical and cultural imagination, the project culminated in a ceremonial and collaborative burning of the structure with resident artists and the local community, reclaiming fire from a destructive and violent force to one of healing and regeneration. 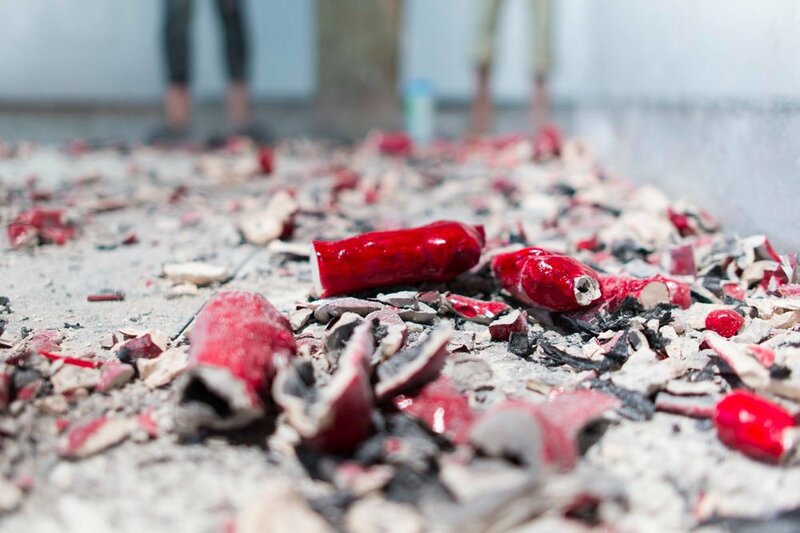 Part installation, part audience-driven performance, BREAK examines ceremonial acts of catharsis involving the creation and destruction of totemic or sacred objects. The artist created a subversive space that facilitated a ritual performance which allowed for a temporary suspension of normal social behavior – particularly that within an art gallery. BREAK consists of a white wall-mounted grid, a new kind of shrine, housing ceramic figures developed from the artist’s research into the ubiquitous and ancient ceremonial use of dolls. In front sits a plinth that has been transformed into an altar. With no formal instructions, members of the audience are intuitively invited to select a ritual doll and - standing on a pedestal facing the collective audience - smash it. Raising questions about the way museum objects are thought of as being able to transform the viewer morally or spiritually, BREAK collides the objective, rational, contemporary art spectacle with an audience driven, sacrificial destruction of artworks. A collaboration with a group of three performance artists lead to a series of evocative and emotive performances that played the role of opening ceremony and audience instruction. 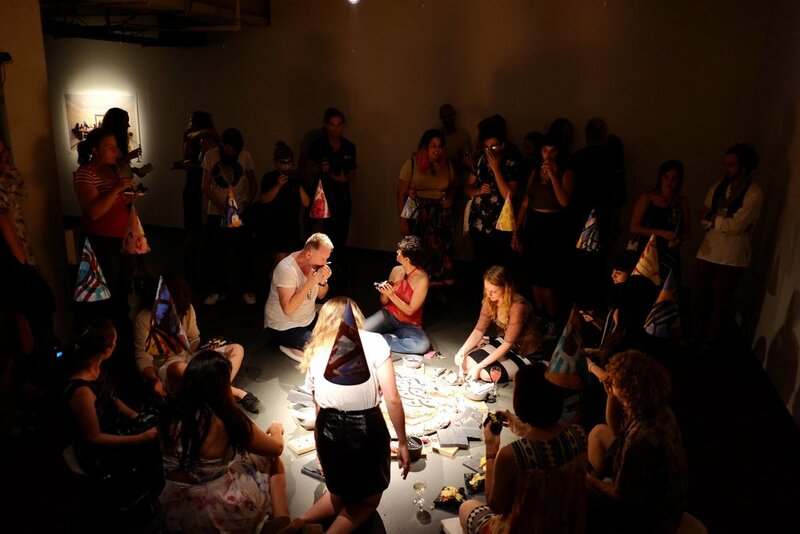 Ritual Gathering transforms a modern birthday celebration into a powerful symbolic event. 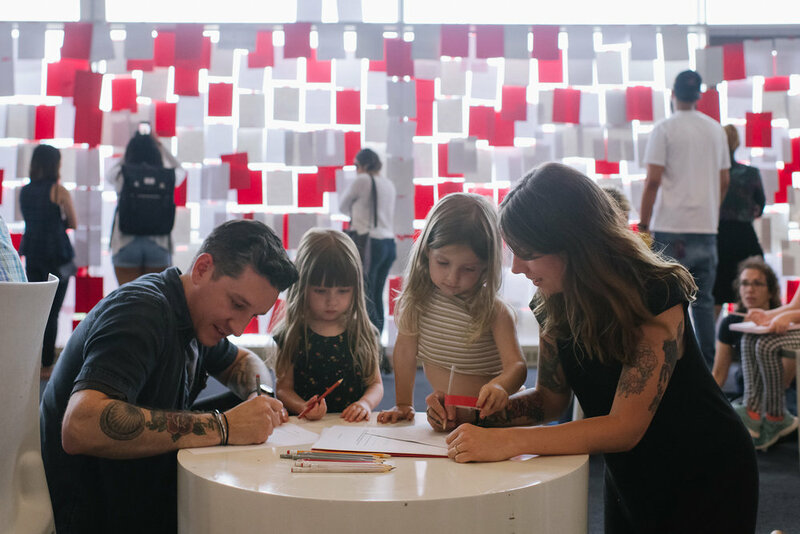 The participatory installation disrupts the spatial hierarchies and viewing protocol of an art museum context to antagonize and reimagine the conventional language of art. The work sought to highlight the audience’s intuitive, triggered response to a deeply ingrained ritual process by presenting them with specifically arranged motifs to which they had to respond with no instruction. 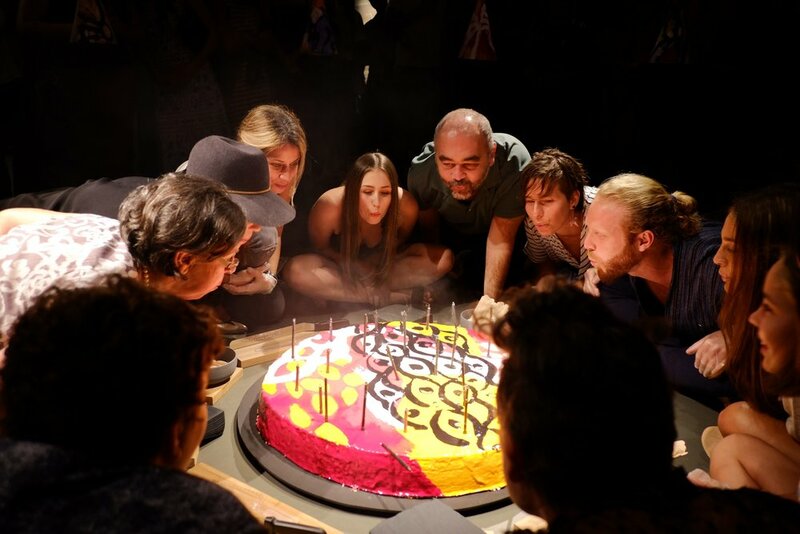 The installation’s focus is a large painted cake - a living artwork that is consumed on the exhibition’s Opening Night - created in collaboration with Australia’s most celebrated patissier Adriano Zumbo. 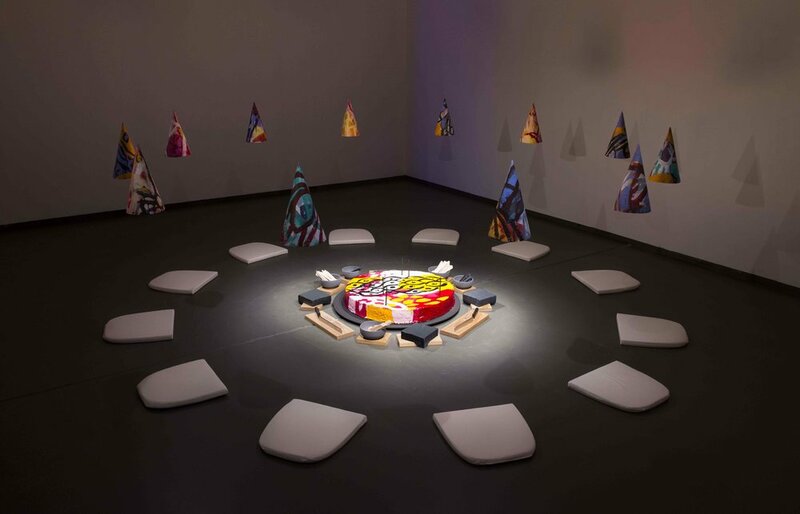 Twelve hand-painted birthday hats appear to float at head height under which twelve cushions act as place settings, inviting audience members to sit together and participate. 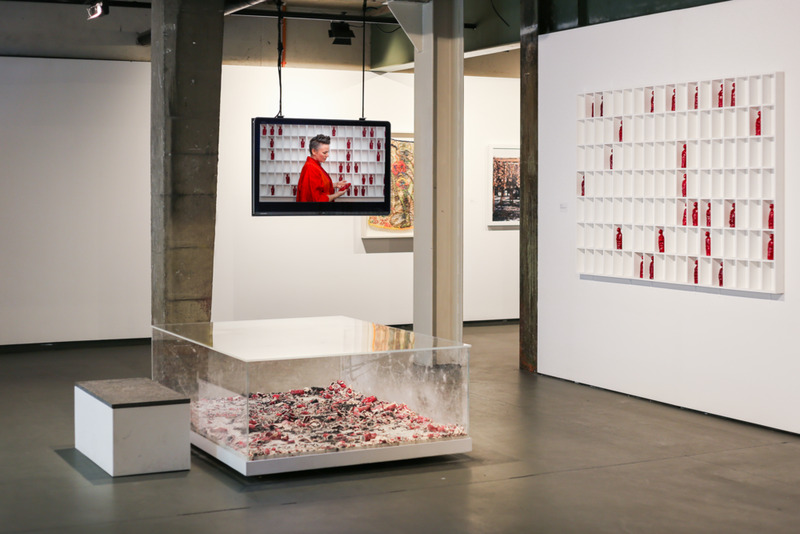 It intended to question the contemporary Western dislocation between art and ritual by challenging the audience’s role within the gallery space.